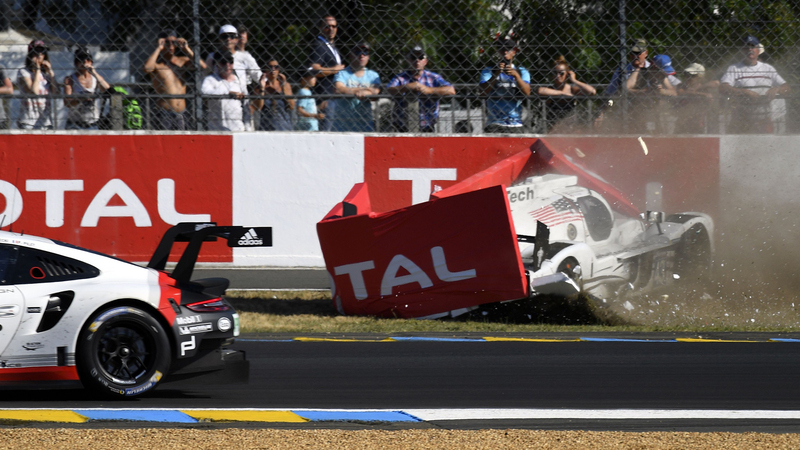 Join us as a crack team of sleep-deprived writers live blog the entire 24 Hours of Le Mans. Welcome to the 24 Hours of Le Blog. The Drive has assembled a crack team of writers who are foolish enough to stay up for the entire 24 Hours of Le Mans. We'll be following the race to bring you updates, clips, pictures, and anything else race related for the full 24 hours. The most recent happenings will be at the top of the feed on this page. Feel free to ask us questions or leave a comment at the bottom of the page, we'll do our best to answer everyone. Thank you to everyone who stuck through this race with us, and thank you to all of my co-contributors on this one. What a race, what a finish. This is what endurance racing is all about, and it just goes to show that you should never give up, even when you're 18 laps down to the lead. Well done to Timo, Brendon, and Earl. - Bradley Brownell signing off. Time to get some sleep after 25 hours awake. 0:00 - Porsche #2 Timo Bernhard, Earl Bamber, & Brendon Hartley win Porsche's 19th Le Mans 24 Hour! That is three in a row for Porsche 919 Hybrid program. #38 Jackie Chan DC Racing wins LMP2 class #87 Aston Martin Wins GTE Pro class. #84 Ferrari wins GTE Am class. Corvette crosses the line in third and stops on the straight. #67 Ford managed to take second in GTE Pro from Taylor in the Corvette. First to third in one lap. 0:01 - Jonny Adam is all over the back of the Corvette. Runs wide at Ford Chicane, Aston Martin Jonny Adam takes over the lead of GTE Pro. Corvette has braking issues. Puncture for the Corvette and into the wall! 0:02 - Corvette runs through the gravel trap at Mulsanne chicane on the penultimate lap. Manages to stay ahead of the Aston Martin. 0:03 - One more lap for the Porsche #2 and it's all over. 0:04 Aston Martin Adam makes a deep dive on Corvette Taylor, but goes too deep on braking and Corvette re-takes GTE Pro lead. 0:07 - Things have settled into a rhythm for the final few minutes. Aston Martin still attacks the Corvette for GTE Pro honors. Those two are very evenly matched; 3 laps, possibly two really slow laps. 0:08 - Billy Monger made an appearance at Le Mans! 0:14 - #91 Porsche 911 RSR pits from third in GTE Pro for a splash of fuel and tires. Ford #67 passes for position while the car was stationary. 0:22 - Le Mans circuit claims 258,500 attendees for the great endurance classic. 0:23 - Porsche #2, as we later made a correction, has pitted for a splash of fuel and back out. 0:38 - #35 Alpine has been rolled into the garages. 0:39 - After 23 hours of racing, the lead in GTE Pro is less than one second. Jordan Taylor leads over Jonny Adam. 0:42 - Alpine #35 - Negraom, 2nd in P2, 3rd overall, in the wall at Arnage. Local yellow flag waving. 0:47 - Aston Martin and Corvette pit from the lead of GTE Pro for a splash of fuel and back out with the Corvette ahead of the Aston. 0:49 - It is possible that our math is wrong about the #2, they potentially will still need a splash of fuel to make it to the finish. They stopped at 54 minutes, and a full tank will only get them to 51 minutes unless there are slow zones. 0:51 - Ford #67 in the pits from third in GTE Pro. #91 makes the pass for position while the Ford is stationary. 0:56 - Porsche #2 making its final stop for fuel. It should be fueled up to the finish of the race from here. 0:59 - #2Manor car stopped on pit-lane. Team members pushing the car to its pit stall. 1:00 - 23 hours gone, just one remains. Porsche leads the race overall again with the #2 car that suffered a failure at the 3 hour mark. Twenty hours of catch-up and a never-give-up attitude. Timo Bernhard just has to hold on for one more hour. 1:05 - Alessandro Balzan has finally returned to the pits. The rear suspension of the Ferrari is broken, possibly beyond repair. 1:07 - Porsche #2 makes the pass for the lead in the braking zone for Indianapolis. LMP1 leads the race again with just over 1 hour remaining. 1:08 - The #2 Porsche in second overall is now within sight of the overall lead. It could happen this lap. 1:10 - Porsche #91 in the pits for tires and fuel. Driver stays aboard. They should have one more stop to get to the flag. 1:21 - Ferrari #65 is kicked into a spin, rejoins but is running slowly. Car has a puncture and is smoking heavily. Alessandro Balzan has to nurse the car all the way around to get it changed. The spin was caused by the #50 Corvette. 1:29 - Timo Bernhard trails the overall lead by just 1 minute 15 seconds. Currently gaining at about 12 seconds per lap. If everything stays the same, he should catch the leading JCDC LMP2 #38 in just over 6 laps. Certainly before his next stint. 1:31 - Toyota #8 sets the fastest lap of the race from 10th overall. 3 minutes, 18 seconds and change. 1:35 - Just one and a half hours remain in this incredible race. Here's a rundown as they stand. LMP2 - Ho-Pin Tung leads the race overall for JCDC Racing #38. Second placed LMP2 sits 2 laps down. LMP1 - Timo Bernhard is hunting the overall lead in Porsche #2. Toyota trails in LMP1 some 10 laps down. GTE Pro - Jonny Adam leads for Aston Martin #97 just 15 seconds ahead of Porsche #91. GTE Am - Will Stevens leads in the JMW Ferrari #84 about a lap ahead of the #55 Ferrari. 1:39 - All else being equal, Bernhard should only need one more stop before the end of the race. The leading JCDC LMP2 will need two stops from here to make it to the finish. 1:41 - #2 Porsche pits from second overall for fuel only. Quick stop and back out. Timo stays in the car. 1:47 - It is the middle of the day, and it's getting really hot out there. 2:03 - #45 G-Drive spins off at Mulsanne corner. Car has been beached in the gravel and local yellows are out. Slow zone coming. This is not good for Timo Bernhard. 2:09 - Timo Bernhard moves the #2 Porsche LMP1 onto the lead lap of the race, passing the JCDC LMP2. Only just under one lap to gain back at this moment. 2:14 - ARC Bratislava LMP2 comes into contact with #13 Rebellion and spins at the Dunlop corners. 2:20 - Porsche 91 pits for fuel and tires. No driver change, Mako will be in to the finish. The Porsche has spent the least amount of time in the pits compared to the other two top GTE Pro runners and that could make all the difference. 2:22 - Just a reminder that Brendon Hartley posted this on Instagram at about sundown last night. "out of contention". This car is now just one lap down and looking to win overall. 2:26 - Porsche #2 919 Hybrid in for fuel, tires, and driver change. Brendon Hartley hops out and Timo Bernhard in to close the race. 2:29 - The Corvette on Aston Martin battle continues to rage hours later in GTE Pro. Porsche leads the class. 2:34 - If you want to feel anxiety, watch the Porsche #2 onboard video. Each pass on a slower car is giving me heart palpitations. 2:43 - #13 Rebellion still having re-starting issues every time they pit. The car's starter motor will not turn without a bit of massaging with a beat from a big hammer. This car was, at one point, leading its LMP2 class. 2:47 - Andre Lotterer calls Le Mans a "cruel" race. And dammit, he's right. 2:54 - Overall Leading #38 LMP2 Jackie Chan DC Racing car requires a rear wing change, spending a very long stop in the pits. 3:00 - Kazuki Nakajima in the #8 Toyota has moved into the top 10 overall. Still about 12 laps down to the current leader. With the way this race has gone, if they are running, they could win. 3:04 - Rebellion #13 of Mathias Beche pits for a standard top, Brendon Hartley Porsche #1 moves into second position overall. 3:04 - Even more jokes. 3:06 - Pass for the lead in GTE Pro. 3:09 - Porsche #1 officially marked a retirement on the Timing and Scoring screens. That's it for Andre Lotterer. 3:12 - Porsche #2 pits for a standard fuel stop. 3:15 - Tight battle in GTE Pro between 97 Aston Martin and 63 Corvette sees the Aston move ahead at the second Mulsanne chicane. 3:17 - Porsche #91 pits for fuel only from the lead of GTE Pro. Corvette #63 of Jan Magnussen should take over the lead of the class. 3:26 - Brendon Hartley in the Porsche #2 has passed the Pierre Ragues #35 LMP2 car for fourth overall, effectively third when discounting the dead #1 still in the "lead". 3:27 - #23 Panis Barthez car stops on track and the driver is out of the car. 3:29 - The #1 has been pushed behind the wall and the slow zones have been cleared so Brendon Hartley is on maximum attack. 3:35 - Slow Zone declared as Lotterer is getting back in the car. Stewards are pushing the car, which should count as "outside assistance" and will disqualify the car regardless. 3:40 - Like you mean it! Brendon Hartley is now running flat-out, within a few tenths of that car's fastest lap in the race. Gaining some 15 seconds per lap on LMP2. 3:42 - If Porsche is going to win this race, it is unlikely that they can count on the #1 to do it. The #2 Porsche will need to make up 3 laps to the leading LMP2 Jackie Chan DC car of Oliver Jarvis. 3:45 - Porsche #1 on the Mulsanne has a LONG way to get back to the pits. Over a 7 mile lap, and he's got about half of that to go. 3:47 - The cruelty of Le Mans is truly boundless. Of six lead class cars, every single one of them has had some form of failure. 3:49 - Porsche #1 driver Lotterer calls in with "no oil pressure". He is far enough away from the pit lane that it is unlikely he will make it back to the pits. 3:50 - #1 Porsche is slow on course. No oil pressure. 3:54 - Aston Martin #97 is in the pits for fuel. Daniel Serra in the car. #63 Corvette cycles through to the lead. 3:56 - How do you describe Le Mans in one word? 3:57 - The GTE Pro battle is still ludicrous with the 63 Corvette leading the 97 Aston Martin and 91 Porsche. The three cars are separated by only about 40 seconds. 3:58 - This is a weird statistic, but apparently if you add up the number of KMs covered by all of the cars, this is a huge number. 4:00 - Hey everyone, Brad Brownell back in the hot seat. I'm here to take you through to the finish. We're 20 hours into this mega race, and can't wait to see how it all shakes out. 4:10 - Jarvis remains in second place overall and first in P2 with the #38 car. His even performance has kept him stable over the last hour. 4:19 - Lietz jumps ahead of the GTE Pro Class and Denari slots in behind him with the Ford GT in second position. 4:31 - Checking back in with the GTE Pro Class -- Garcia and the Corvette remain in front with Derani's Ford GT taking third over the Aston Martin. 4:33 - The car finally leaves the pits, but will likely face penalties after the crew had hands on the car while it was running. To this point, the #23 is in third place overall and second in P2. 4:35 - #23 Vaillante Rebellion having starting problems in the pits! The crew can hardly get the tail off to address the issue. A bit of cooling duct had fallen off from the rear brake as well. 4:43 - Hartley switches into the #2 Porsche 919 Hybrid and continues out of the pits. 4:47 - Antonio Garcia and the #20 Corvette C7.R sit atop GTE Pro with the #91 Porsche 911 RSR running behind him. 4:55 - Corvette C7.R Art Car saves its face by avoiding the wall and steering out of the gravel. 4:58 - Richard Lietz takes a wicked four wheel drift into the gravel but recovers without losing too much ground. 5:00 - What a shot from the famed Dunlop Bridge. 5:01 - Temperatures keep climbing, and the environment gets harder for both the drivers and their cars. 5:04 - Lietz's Porsche falls to third while the Corvette C7.R and Aston Martin Vantage battle for first. 5:14 - Close call! There used to be a wall there! 5:18 - Nico Prost finally loads back into his Vaillante Rebellion after waiting for his crew to replace the internals of his car's gearbox. 5:22 - Will Owen spins rapidly off course and into the gravel with his Ligier JSP217. A rocky drive to the Porsche Curves sets him back on his way, but not without a strong reality check. 5:25 - LMGTE Am leader Dris Vanthoor spins on track, but retains his place in the #27 Ferrari 488. 5:26 - Jordan Taylor and his Corvette are in for a scheduled stop while FRÉDÉRIC MAKOWIECKI's Porsche takes first in GTE Pro. 5:29 - Fairly quiet now, but a host of driver changes are soon to follow. In the meantime, Nico Prost is hovering over his mechanic crew and doing his best Stig impersonation to hide his anger. Aye aye aye..
5:41 - Tandy hops the Porsche to the pits with a 12 lap lead. Overall, they're ahead of the nearest competitor by 42 minutes. 5:45 - Jordan Taylor takes the LMGTE Pro lead in the #20 Corvette C7.R while the Aston was in the pits. 5:49 - Nico Prost and his car are still in for repair. Reports say that it's having problems getting oil to the gearbox, putting the team at a standstill for the time being. 5:51 - Cameras pan over to the pits with the remaining Toyota LMP1 in focus. It's obvious that spirits are low after another blow at the 24 Hours. 5:54 - Aston Martin holds a two-second lead over Jordan Taylor in the #20 Corvette C7.R. 5:55 - Nico Prost is having gearbox issues after running fourth in the LMP2 class. 6:00 - Hey, crew. This is Caleb Jacobs, and I've been tagged back in for coverage over the next couple of hours. If you've got any questions, make sure to send them to us here or on The Drive's social media. 6:03 - Porsche #91 pitted for fuel and rejoins. Porsche mechanics were taking photographs of the car's front brake rotors. 6:04 - Aston Martin #97 takes over second place in GTE Pro from Jordan Taylor's Corvette. Porsche #91 meanwhile, pits from the lead of the class. 6:05 - The battle in GTE Pro. The Aston just passed the Corvette. 6:10 - The #95 Aston Martin has slowed and is heading back into the pits. 6:16 - GTE Pro currently has an epic battle for second with Tincknell's 67 Ford, Taylor's 63 Corvette, and Jonny Adam's 97 Aston Martin absolutely nose-to-tail. 6:18 - Porsche #91 is spotted on circuit without its class-position lights illuminated. This can be deemed a safety issue and the car may be required to fix that problem at its next stop. Currently the car is leading GTE Pro. 6:20 - Porsche #1 pits from the lead with a 12 lap gap to second overall. Nick Tandy takes over the 919 Hybrid for this stint with a full service of tires and fuel. 6:22 - Jordan Taylor pits the #63 Corvette from the lead of GTE Pro. No tires, no driver change. Fred Mako moves his #91 Porsche to take over the lead. Harry Tincknell's Ford moves into second. Corvette returns in 3rd. 6:35 - Aston Martin #95 has a massive brake lockup and bumps the wall in the gravel at Mulsanne corner. The car's brake's have reached the end of their usable life. The car was second at the time, has fallen to third, and will be forced into a lengthy pit stop. Richie Stanaway was on his out-lap at the time of the incident. Only one class still has multiple cars on the same lap as the leader. 6:45 - Porsche #1 is running a very conservative 4 minute 34-ish second pace, just trying to pound out laps and keep a good gap to the leading LMP2 12 laps behind. 6:45 - Golden hour at Le Mans is pure magic. 6:48 - The #22 G-Drive has returned to the race after 23 minutes in the garage. 6:53 - Update: Apparently the #13 car would not re-fire on pit lane after a normal pit stop. David Heinemeier Hansson has gotten on board. After a few minutes in the garage it has been wheeled back out and is now running and away. 6:55 - #13 Rebellion of Nelson Piquet, Jr. is wheeled into the garage from second in LMP2 and third overall, presumably to fix the gearbox problem they've been dealing with for several hours. Perhaps it has gotten worse? 6:58 - Porsche pits the #91 from the lead of GTE Pro for fuel, tires, and driver change. Aston Martin #95 takes over the lead of the class. 7:07 - James Calado pits the 51 Ferrari from the sharp end of the GTE Pro class. The front of the car is severely damaged, and the car has been dollyed into the garages. 7:13 - The #22 G-Drive Oreca is in the garage for repairs. The team have run out of spare nose cones and will be using one of the Dragonspeed Oreca's used noses to get the car to the finish. 7:15 - Porsche #1 leading LMP1 pits for fuel. No tires, no driver change, in and out quickly and without incident. 7:19 - Patrick Pilet leads GTE Pro in the #91 Porsche from James Calado in the #51 Ferrari. Just two and a quarter seconds separate them. This is going to be good. 7:21 - #22 G-Drive Oreca has ended up in the wall again with Jose Gutierrez onboard. This car is currently sitting 46th overall. 7:24 - Porsche #93 has passed Porsche #77 for sixth in GTE Am. Ferrari lead that class 1-2-3. 7:30 - Toyota remains hopeful. There is a saying at Le Mans, that getting your car to sun-up feels like a victory on its own. Let's hope they can keep it together for another seven and a half hours. 7:30 - Things have calmed down on track for time being, but lap times are still coming down. 7:41 - Toyota #8 has recovered to 16th overall and 3rd in LMP1. 7:56 - Complete race standings after 16 hours of racing. 8:00 - Hey everyone, we're 2/3 of the way to the finish, and while the sun is shining bright in Le Mans, we've just entered the darkest part of night here in Pacific Time. Brad Brownell back for another couple of hours reporting live for you. If you have questions, let us hear them. 8:01 - Porsche #1 pits from the lead again for fuel and no tires. Neel Jani nearly misses the team pit box. 8:10 - Porsche 919 Hybrid is blocked by LMGTE Pro cars! The Ferrari and Porsche duo aren't quite sure what to do. 8:18 - No news here, the 911 RSR just keeps on screaming around track. Can't get enough of that. 8:20 - Krohn in the LMGTE AM #83 Ferrari spins off track and into the gravel. Slow zones are out after the accident. 8:28 - The #51 Ferrari and #63 Corvette C7.R keep battling for 2nd position in LMGTE Pro. After almost 16 hours, the top six GTE Pro cars are still running so close together. 8:31 - #40 Oreca car, which is 6th overall, is beached in the gravel. He braked late into Indianapolis and ended up in the wall. He'll get pulled out and will hit the pits for a new nose. 8:36 - Pat Long in the #93 Porsche just ran the fastest lap for the GTE AM team. 8:38 - Happy Hour! Track conditions start to change as the weather warms up at the 24 Hours. 8:39 - #95 Aston Martin Racing SØRENSEN leads LMGTE Pro while #91 Porsche is in the pits. 8:51 - Back to green flag running! Porsche is leading by 10 laps, setting the standard for what's left of LMP1. 8:59 - Two LMP2 Oreca cars sit in podium position with less than 9 hours to go. 9:10 - #84 Ferrari leads LMGTE AM and goes through the pits for a brake change. 9:12 - The car in the crash has been identified as the #28 TDS. What a crash into the barricade -- the gravel had no chance at slowing that down. 9:13 - Ferrari #51 takes advantage of the break and hits the pits. 9:18 - It looks like #28 TDS LMP2 has run off to the gravel and a safety car is out. The car is in very bad shape and the ambulance is on the scene, hopefully just as a precaution. 9:19 - #8 Toyota Buemi stops for new tires and is out of the pits. 9:24 - Morning had broken! 9:28 - Rubens, we want a milkshake! 9:33 - LMP2 #34 Ligier hits the gravel. Yellow flag is out, slow zone around the incident. 9:44 -- LMP2 3rd position Canal makes an unusual stop just past the Dunlop Bridge. Canal keeps his position after the halt. 9:47 - An orange hue is starting to rise over the Dunlop Bridge, signaling hope for the next 60 minutes or so. 9:48 - Both the #40 and #24 Oreca LMP2 cars continue to battle for 5th. 9:54 - About another hour of darkness before the sun pops up. Each of the remaining 919 Hybrids are staying on a steady pace towards the finish. 9:56 - Porsche #91 hits the pits for a quick service. 9:57 - Hey, everyone. I'm Caleb Jacobs, and I'll be taking over for the next couple of hours. Keep checking back with us as we give you crucial updates for this nighttime stint of the race. 10:00 - Dragonspeed #21 LMP2 pits and is wheeled into the garage. 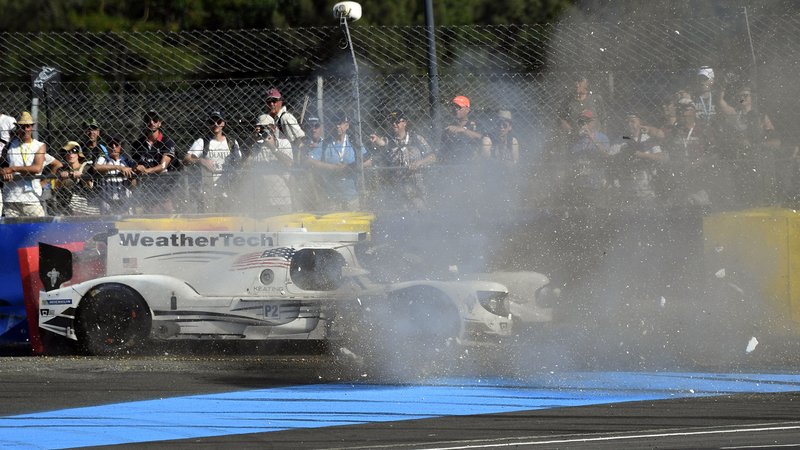 The car experienced some kind of explosion on the Mulsanne and limped slowly back to the pits. Both ends of the car have been removed. 10:04 - Porsche #1 pits from the lead. Fuel only, and re-released. Still holds an 11 lap lead. 10:06 - This is what we are not doing. We'll be here until the end! 10:14 - #13 Rebellion LMP2 pits from second, loses position to #38. Stop includes fuel, tires, and driver change. Nelson Piquet, Jr. now aboard. 10:35 - the #92 Porsche 911 is out. The rear right was heavily damaged. 10:40 - #33 TDS LMP2 with Pierre Nicolet on board has gone off track and hits the wall. 10:55 - Meanwhile, #50 Corvette Art Car spins into the gravel with Fernando Rees at the wheel. 10:58 - Porsche #92/Michael Christensen in the wall at the Ford Chicane, trying to get the car re-fired. 11:14 - Ford #67 pits for fuel, tires, and driver change. Luis Felipe Derani out of the car, Andy Priaulx in. Currently running 5th in class. 11:31 - #13 Rebellion pits. Heinemeier Hansson stays on board. Fuel only. 11:38 - Porsche #1 pits for fuel, tires, and a driver change. Nick Tandy out, Andre Lotterer in. 11:39 - The #31 car has returned to the circuit with Lauda still aboard. This is his fifth stint in a row. 11:46 - The #31 car is going up on dollys and is spun around into the pit garage for further investigation. The nose is being removed from the car, this could be a long stop. We must remind you that this car was running second position overall when it came in. 11:47 - Nicolas Prost pits the LMP2 leading #31 Rebellion, calling in to the pits saying "Something is broken". in to the pits saying "Something is broken". 12:00 - We've reached the half-way point of the race, and this has been a very strange race thus far. This is a real old-school race of attrition, last-car-standing kind of year. Porsche continues to lead in LMP1 and overall with the #1 car, Nick Tandy aboard. 12:05 - #2 Porsche is in, Brendon Hartley takes over driving duties. 12:06 - The end of Toyota's day. 12:16 - Replay of Lapierre getting saluted by the crowd after his day came to an end. 12:20 - Porsche #92 is siting right on the rear bumper of the #97 Aston Martin fighting for 2nd in GTE Pro. Rather than continue dicing, the 92 dives into the pits for a fuel-only stop. 12:23 - Nicolas Prost pits for fuel in the #31 Rebellion. Returns to the track retaining the lead of LMP2 and 2nd overall. 12:21 - The #50 Art Car Corvette showing it's true colors at night. 12:25 - Race leading Porsche #1 car returns to the pit lane for a routine service fuel stop. It looks like they're taking a smart, and very conservative, strategy. 12:29 - Konstantin Calko beaches his Ligier LMP2 #49 in a really big sliding moment, calling out a yellow to grab him out of the gravel. Looks like it was possibly caused by a rear tire failure. 12:31 - GTE Pro leading #71 Ferrari of Miguel Molina pits for fuel. Aston Martin #95 moves back into the lead. Pro leading #71 Ferrari of Miguel Molina pits for fuel. Aston Martin #95 moves back into the lead. 12:35 - Ferrari #62 with Townsend Bell aboard tipped into a spin by what looked like an Aston Martin. Recovered and re-joined. Nope, it was the #55 Ferrari of Marco Cioci that initiated that spin. 12:35 - We're 11 and a half hours into this race, and it's been dry the entire run. When is the rain coming? 12:42 - Porsche #92 passes Ferrari #51 for fourth in GTE Pro, with Kevin Estre outdragging Alessandro Pier Guidi down the Mulsanne straight. 12:47 - Porsche #91 pits for a driver change and new tires. Fred Mako now in the car, Patrick Pilet stepping out. Currently running third in class. 12:53 - Here's a pretty picture to take your mind off of things a bit. 12:57 - Corvette #50 goes off and returns to the circuit unscathed. 13:06 - Porsche's #2 with Earl Bamber at the wheel currently sits 18th overall, some 18 laps down to the lead, but is gaining on the LMP2 field. The sole remaining Toyota, the #8 with Ant Davidson aboard, is 29 laps down from the lead in 52nd position overall. 13:11 - Following that safety car delay, the race has resumed with the #1 Porsche in the lead of LMP1, #31 Rebellion leads in LMP2 (second overall), the #51 Ferrari leads GTE Pro from the #97 Aston Martin by just 3 seconds, and the #84 Ferrari leads GTE Am. 13:12 - Safety car is leaving and the race has gone back to green after a lengthy full-course caution. Let's go racing. Porsche #1 immediately pits for service. 13:14 - There is talk that people around the track are giving standing ovations for each Toyota driver solemnly walking back to pit lane. Add our sentiments to theirs. They put in an amazing effort and ran as best they could. You don't win at Le Mans, you survive. 13:13 - And we're back. Bradley will be taking over again for a while. 13:20 - Hi everyone. We are taking a quick 20-minute break to regroup for the second half of the race. This seems like a pretty good time step away for a few minutes. We'll be back in just a little bit. Thanks! 13:32 - Lapierre tells the Toyota team that there is nothing left in the car. He's getting out. Toyota is crushed. Absolutely crushed, This was supposed to be their year. The #9's tire blew and Lapierre, frankly, drove the car too hard trying to get back to the pits. The tire carcass destroyed the rear deck of the car. 13:34 - #9 is moving again, very close to the pits. It has massive damage. If it's fixable, it's going to take a very long time to do. But he still has to get into the pits. The team can't get the car until it crosses the pit entry line. The car is still about 200 yards away and has stopped again. 13:39 - The #9 is stopped again. 13:41 - Safety car for the Toyota and the #25 Manor LMP2. The Toyota is moving again, but is limping to the pits. 13:43 - The #9 is on fire. 13:46 - The #9 Toyota has a right rear puncture, the tire is destroying the rear bodywork. It's tearing the car apart. He's taken out the hydrolics. 13:53 - The #7 has pulled off and Kobayashi is out of the car. It's over. The car is done. 13:58 - The #7 got moving again under electric power, but it's still not right. They just need to get it back to the pits. Kobayshi is trying to harvest power under braking to get the car back to the pits. He;s moving at about 12 mph. 14:03 - The #7 has stopped on track. This has to be heartbreaking for Toyota. It has no petrol drive or electric drive. 14:11 - Scott Dixon under investigation for overtaking under the safety car. The #1 Porsche is lapping the #7 Toyota as is still limps all the way around the track. 14:16 - Back to green, the #7 Toyota is going slow, having gearbox issue. Kobayashi says "I can not move." The #1 Porsche takes the lead as the #7 flounders around. To add insult to injury, the #7 is under investigation for an imporper pit exit. 14:25 - #7 Toyota pits for a full service and driver change. Conway out, Kobayashi in. #50 GTE Am Corvette pits for a new door. The Toyota may have rejoined the field early, thus getting a "free" pit stop. It looks like someone other than a marshall waved him through pit exit. 14:30 - #1 Porsche clips a curb and spins going into the pits under the safety car. 14:41 - SAFETY CAR! First safety car of the race; needed to clean up the gravel dumped all over the track by the #66 Ford GT. There are three safety cars that will go out on track, which will split the field in some placed, and bunch it up in others. 15:50 - #66 Ford GT with Pla at the wheel, of at Indianapolis, just lost the back end and spun into the gravel. Slow Zone around the car is active as the GT is stranded. It's being pulled out so it can head to the pits for service. There is some damage to the right rear suspension. It's back in the pits and going into the garage. 15:07 - #7 Toyota pits from the lead. #13 LMP2 pits, needs new rear end as the lights were damaged. 15:11 - #9 Toyota into the pit. It needs the right side number panel replaced, it's taking a long to get the new one in. #31 LMP2 into the pits, too. 15:30 - #17 LMP2 spins, the #7 Toyota is slowly going back together, drops to 16th overall. 15:37 - #7 Toyota reported for overtaking under yellow, no word on a penalty yet. 15:44 - LMP2 leader, #13 Rebellion pits, Piquet stays at the wheel. 15:57 - #92 Porsche 911 fighting with and takes second from the #67 Ford GT. The Porsche then pits, followed by the #66 Ford GT that was in fourth. The #67 Ford stays out and retakes second place. 15:55 - #2 Porsche and #9 Toyota pit together, leave in same positions of 2 and 3, respectively. 16:00 - The #8 Toyota is getting torn apart, probably had an MGU failure; front motor unit. It will take a while to repair. 16:03 - #71 Ferarri gets a drive-through for abuse of track limits. 16:09 - #64 Corvette, with Tommy Milner driving spins due to a missing a rear left tire. It had a blowout and the rear wing was torn off, probably from the debirs. In trying to get into the pit, he spun again and got beached in the gravel at pit entrance.debirs. In trying to get into the pit, he spun again and got beached in the gravel at pit entrance. 16:14 - Buemi in the #8 Toyota is told there is a sticking brake caliper. They pit him and the front right brake was on fire. The car is pulled into the garage as smoke continues to pour from the brakes. The #1 Porsche is now in second place, 36 seconds behind the #9 Toyota for the overall lead. 16:18 - #67 Ford GT, #51 Ferrari, and #63 Corvette hit the pits in tandem. These GTE Pro cars have been running so close all day, it should lead to a very close finish. Andy Priaulx is out of the Ford. 16:24 - The #98 Aston is coming out of the garage to rejoin the race. There was some talk of a possible penalty for a pit infringement when it came in for repairs. 16:30 - Senna in the #31 overtook under yellow while leading in LMP2, gets drive-through penalty. 16:31 - #23 LMP2 in pits, stalls after stop. 16:35 - #98 Aston is in the garage in need of repairs from the tire blowout, needs new splitter, front right quarter panel, brake lines, rear wing mount... it's a lot of work. 16:38 - Buemi reports problem with #8 Toyota, smoke is coming out of the back of the car. Oil is leaking out of the #8. 16:40 - This is Gabe, again. I'm back again providing you with updates on all the action. I'll be here for an hour or two or more. 16:44 - #1 Porsche goes in for a fuel stop and driver change. 16:45 - Yellow flag after the leading #98 Aston Martin suffers a huge puncture on the Mulsanne straight. Lots of carbon fiber shards scattered across the track. 17:01 - Is nothing sacred? 17:06 - The Keating Motorsports #43 car is stopped on track, with lights off. This indicates the engine is likely off. It is stranded in the Porsche Curves. 17:09 - The #49 LMP2 has spun off at Indianapolis. 17:14 - #64 Corvette pits during the yellow. 17:16 - The #60 Ferrari slid into the sand, causing a yellow flag. 17:20 - Replay of Toyota vs. Porsche fighting for 3rd. 17:30 - We're still seeing the Toyota lose the lead every time it pits, gaining it back shortly when the Porsche pits. 17:42 - #1 Porsche was 23.678 seconds behind the leading #7 Toyota at the beginning of the lap. #8 Toyota was 3 seconds off the trail of the Porsche. 17:50 - 7 minute stop and hold for the #28 LMP2 car for punting the #82 Ferrari into the barrier and destroying it. 17:54 - #23 LMP2 car had front end swapped during pit after aero-affecting damage. 18:04 - #37 LMP2, driven by Cheng, went off and is stuck in the gravel. Slow zone in effect. 18:04 - #49 car receives a stop and go penalty for speeding in the pit lane. 18:06 - The #64 Corvette team's pit stop was slowed by a cameraman who got in the way during the driver switch. 18:14 - Near the back of the GTE Pro pack, the #95 Aston Martin has passed the #63 Corvette to take 11th in the class. 18:17 - Driver change for the #13 LMP2 car. Piquet Jr. takes the helm. 18:20 - Fässler in the #64 Corvette is now fighting for 2nd place, attempting to pass the #67 Ford GT. Priaulx, in the GT, is holding him off. 18:25 - replay of a Porsche 911 GTE Pro pit stop. 18:33 - Sarrazin pitted for fuel, Porsche leads again. 18:37 - #61 Ferrari's entire tire has shed off. It's now driving on the wheel. Appears to have damage to the rear end and some aero equipment. 18:39 - #61 Ferrari is attempting to get back to the pits after a massive tire failure. Smoke from tires is still pouring off the back. 19:00 - Yellow flag after #82 Ferrari has a hard crash just before the Forza Chicane. The #82 Ferrari moved over to let the #28 LMP2 car pass, but the LMP2 came back over too soon and clipped the front of the Ferrari, sending him careening off the track. 19:14 - #51 Ferrari and #64 Corvette are battling for 5th place in the GTE Pro class. #97 Aston Martin still holds a comfortable lead in the class. 19:23 - #8 Toyota is pitting for fuel. The #1 Porsche lead for one lap after the leading Toyota pitted. They've now pitted and conceded the lead again. 20:10 - DHH runs his Rebellion wide just before the Dunlop Bridge, skittering across the gravel, returning to the circuit without getting stuck. Continues as normal-ish. 20:10 #97 Aston Martin in for tires, no driver change. 20:16 - #98 Aston Martin pits from the lead of GTE Am. Paul Dalla Lana stays in the car. In GTE Pro, an excellent battle ensues between Michael Christensen's Porsche 911 #92 and James Calado in the #51 Ferrari. 20:23 - Francois Perodo has put his #28 TDS Racing LMP2 into the gravel with an understeer/brake lock up incident, bringing out another local slow zone. 20:25 - The #2 Porsche has been elevated up onto the "High Jacks" for further work. This does not look like it will be a quick repair. Already one lap down, possibly more to come. 20:28 - Drama for Porsche #2, wheeled into the team garage. Mechanics have taken the front of the car off and are looking at the front suspension. 20:35 - Sorensen finally makes it to the pit lane. The tire is completely gone, and some of the rear bumper has been torn away. No further suspension or diffuser damage and the car drives away with a full set of new Dunlop tires. 20:39 - #95 Aston Martin's Marco Sorensen has suffered a rear left tire puncture in the middle of the Mulsanne straight from the lead of GTE Pro. This is heartbreaking for the team, losing several minutes. Aston's second car, Daniel Serra has taken over the lead, but Ford's Tincknell is right behind aiming for the lead. 20:47 - After three hours, Toyota #7 leads in LMP1, Rebellion #31 leads LMP2, Aston Martin #95 least GTE Pro, and Aston Martin #98 leads GTE Am. 21:00 - Meanwhile Toyota #9 pits from the back of the LMP1 field to refuel. No tires, no driver change. 21:00 - Ben Keating puts his #43 Riley LMP2 into the wall, bringing out a local slow zone. 21:04 - LMP1 seems to have leveled off for the moment Toyota running 1-2-5 with Porsche 3-4. All five cars still on the lead lap as we close on the third hour, just 1 minute 22 seconds separate them. 21:12 - GTE Pro pit stops happening now. 21:15 - Rebellion leads LMP2 1-2, Mattias Beche passes teammate Nicolas Prost for the lead. 21:16 - Thomas Laurent impacts the wall at Indianapolis Corner (Jackie Chan DC Racing #38). He was running third and rejoins third. The car appears relatively undamaged. 21:19 - Paul Dalla Lana (Aston Martin GTE Am #98), currently 39th overall, has a massive lead on the rest of the GTE Am field, and is running about 4-5 seconds per lap faster than other Am runners. 21:34 - While the #36 Alpine was receiving service in the pits, Jean Eric Vergne's #24Manor took over the lead of LMP2. 21:39 - #7 Toyota in from the LMP1 lead, Mike Conway trades with pole qualifier Kamui Kobayashi. #1 Porsche also pits, Neel Jani out/Nick Tandy in. 21:42 - #8 Toyota into the pits on the next lap, Buemi out/Nakajima in. #2 Porsche also in, Timo Bernhard swapping for Earl Bamber. Both cars managed to change drivers, tires, and fill with fuel in just 1 minute 24 seconds. 21:44 - #9 Toyota pits from fifth, Nicolas Lapierre trades the driving to Pechito Lopez at the end of lap 36. Their last stint was 13 laps. 21:47 - #26 G-Drive Oreca officially retires following crash with #88 Porsche Proton Racing GTE Am several laps ago. 21:50 - Marco Sorensen (#95 Aston Martin) and Olivier Pla (#66 Ford) set the first GTE Pro laps in the 3:51 range. Pla pits the following lap from second. 22:00 - Hello, this is Bradley Brownell, editor of the Porsche-focussed Flat Six Society here to take over for the next two hours. Thanks Gabe for taking the start, it's been a very interesting race thus far. 22:19 - GTE Pro battle for third place: the No. 51 Ferrari, No. 71 Ferrari, and No. 69 Ford are running nose to tail. The Ford takes fourth place at 22:13. 23:31 - The No. 26 G-Drive finally gets back to the pits. It's right rear suspension is destroyed. The crew has a lot of work to do if they want to get the car back in the race. 22:37 - The No. 88 Proton GTE Pro is the first official retirement of the race. 22:44 - The No. 88 Proton Porsche GTE Pro and No. 26 G-Drive LMP2 come together in the Porsche Curves. Lots of debris. The G-Drive stopped on track in a run-off area. The Porsche somehow made it back to the pits. The Porsche has heavy damage. 22:53 - One hour is done. Toyota is running 1-2 for the overall lead. The No. 7 Toyota just retook the lead from the No. 8. LMP2 is being led by the No. 31 Rebellion. GTE Pro is still being led the Aston Martins. GTE Am is headed by the No. 62 Ferrari. 23:07 - GTE Pro leaders are all pitting. The No. 92 Porsche has gotten out in front of the No. 51 Ferrari. The Ferrari retakes the position on track with no problems all. 23:14 - No. 1 Porsche pits, comes out in third. Toyota back in 1-2, they are fighting it out for the lead. The No. 8 takes the lead going into Indianapolis. 23:25 - No. 39 Graff LMP2 has a puncture and is into the pits. The No. 9 Toyota is in the pits, was losing time from the damage on the opening lap. They are getting a new nose on the car. 23:33 - The 2nd through 7th GTE Pro cars are running in a pack. This is going to be interesting to watch over the course of the race. 23:39 - The No. 36 Alpine LMP2 went straight into the Mulsanne Corner and got stuck in the gravel. The car is now free and is on the way to the pits. 23:53 - The No. 9 Toyota LMP1 has had contact with the No. 4 Bykolles LMP1 car. The No. 4 has pitted for a new front end, Toyota may have to pit to replace some bodywork. UPDATE - no contact, Bykolles hit a bollard, which flew off and hit the Toyota. The Start - Formula One's new mustachioed boss Chase Carey is waving the flag to start the race. Toyota starts from the front row with Porsche behind them. Mike Conway has taken off in the pole-sitting No. 7 Toyota. The No. 1 Porsche takes second place. One lap is done. 23 hours and 56 minutes left to go. Good morning! Le Mans is going to be getting underway in about 18 minutes. We are up and ready to. This is Gabe and I'll be handling the first few hours of the race. The start will be frantic, so I'll have our first update posted after just a minute or so after the race gets under way.